The launch line-up features four effect modules. 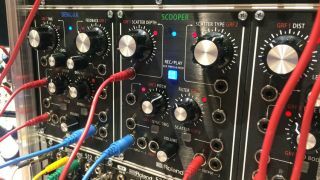 MUSIKMESSE 2015: Roland is getting into the modular synthesis game - and in a big way. Messe sees the announcement of a semi-modular, Eurorack-friendly version of the Aira range's System-1 Plug-Out synth, featuring the same digital synth engine but with additional CV/Gate functionality for communication with a larger modular set-up or other external gear. This is joined by a quartet of Aira-branded digital effects units, which are similarly geared towards both desktop and Eurorack use. These four modules - the Torcido distortion, the Demora delay, the Scooper 'Scatter' effects, and the Bitrazer crusher - can be programmed via computer, smartphone or tablet and have audio I/O and CV/Gate inputs easily accessible on their front panels. The Musikmesse show floor is far from the best place to test out modular gear - even by the end of the first day of the show, it was already nigh on impossible to decode the mass of tangled patch leads plugged into Roland's multi-module demo setup, and we were limited to hearing the results on speakers competing with a backdrop of show floor noise - but we were able to get a rough impression of what to expect from the four effect units. Of the range, the Bitrazer made the strongest first impression with its bitcrusher coupled with a low-pass filter with gutsy resonance range. Cranking both main controls immediately created some bold, crunchy sounds that had no problem cutting through the show floor din. The Torcido module adds a similar layer of pleasing grit, and we'd give the Demora a tentative thumbs-up, even though there was a little too much background noise to evaluate the more subtle characteristics of a delay effect. We're still not too sure what to make of Roland's vague, one-knob-glitch 'Scatter' concept, though (it's the one function on our TR-8 that never gets used), so the jury is out on the Scooper, but we're willing to be talked around once the review units arrive. The cherry on the cake, however, came from the announcement of Roland's forthcoming System-500, an all analogue modular synth system inspired by the System-700 and System-100m. At the show, the 500 is represented by five pre-production modules: a dual VCO, dual VCF, dual VCA, dual LFO and a multi-effect module. Beyond their existence, as a sort-of proof of concept, there's very little information to be had. What we do know is that they're being created with the help of some third-party modular developers, and that the finished product is expected to arrive in the third quarter of 2015.